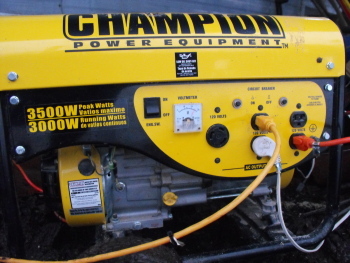 We bought the Champion 3000 watt generator about a year ago for back up power. I took it out of the box, made sure it was all there, and installed the wheels and handle and pretty much forgot about it till this past Friday when our power went out. It was a great relief to feel its gas-powered throaty engine come to life. We only have about 4 gallons of fuel on hand, so we decided to ration our generator time to a few hours in the evenings. This way we can alternate between the freezer and refrigerator, giving them each about an hour of cooling off time, charge our laptop batteries, and power the blower fans that send heat from our exterior wood burning stove to the inner sanctum of the trailer. The new stove configuration is able to keep the back room heated during the night without the fan as long as we keep it fed with fresh firewood. We've got a bit of kerosene, and nearly a full tank of propane as back up for heating and cooking, but I don't think we'll need it if we're able to get out tomorrow and top off our generator fuel. I was most impressed with how easy this generator started. I barely have to pull on the rope and it springs to attention. I'm not sure when we can expect to have our electricity fixed, so I guess I'll be expecting nothing and gearing up to be ready for anything.